“That bus is free”, Hrach tells me, pointing towards a rusting orange Soviet minibus. We’re waiting at the bus stop outside the Opera in Yerevan city centre, surrounded by our luggage. I’m armed with four zhingali, a bottle of tan (salted yoghurt drink) and some smoked cheese sticks for the journey. I look in the direction Hrach is pointing and let out a little whoop: it’s the semi-mythical Charity Bus, taking workers out of Yerevan to the villages, and we’ve come at just the right time for it to carry us out of the city and into the frosty countryside. We sit among grey-haired commuters and watch the shops slide by, eventually thinning out as the highway widens. We climb out, heavily laden, feeling every eye on the bus boring into us. 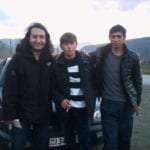 A car soon stops and takes us up to Lake Sevan. We thank the drivers and climb out into the snow. The guy in the passenger seat jumps out and rubs his hands together. I hear the words “hink hazar dram” and wince. Having not mentioned anything when we got in, these guys are now demanding 5,000 dram (about $10) for the ride. I furrow in my bag and draw out 1,000 dram. This would be more than enough to cover any extra expense from the weight of us and our packs. The guy goes down to four, then three. Hrach is still waving the 1,000 dram bill in his face, but he won’t take it. Hrach goes round to the driver’s window to find him laughing like a James Bond villain, smoke curling out of his mouth. He hands him the 1,000 dram note. Now we’re all laughing. The car drives away. Our second ride is with a lovely older man from Jermuk. According to him, Jermuk has the second best water in the world. The very best is apparently to be found in Czech Republic. We make appropriately impressed noises. “I liked the way he spoke to his daughter on the phone,” Hrach tells me when climb out in Vanadzor, “he used very nice words”. Most Armenians still use the old Soviet name, Kirovakan for this city, despite it being renamed Vanadzor in 1992. This is true of many towns and roads in the country, many of which have been renamed countless times over generations. 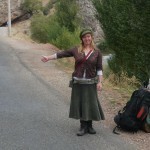 We feast on cheeses, salads and coffee in a restaurant, then walk across the small town to the road to Tbilisi. A car stops. Two older men peer out at us, standing in the snow. One of them, the passenger, seems drunk. He’s in a jolly mood and up for an adventure, so he convinces his friend to take us for free. He chats away with Hrach in Armenian, and asks what the purpose of life is. “One should have a purpose in life,” he says. 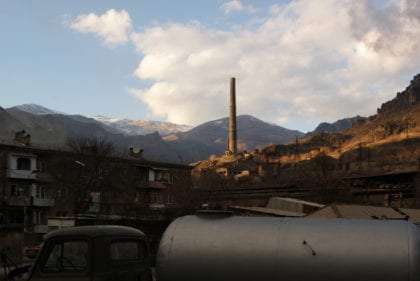 They take us out of the winter weather to Alaverdi, a small city in the North, where a smokestack chimney pokes into the blue sky from an abandoned factory, one of many reminders of the Soviet past. 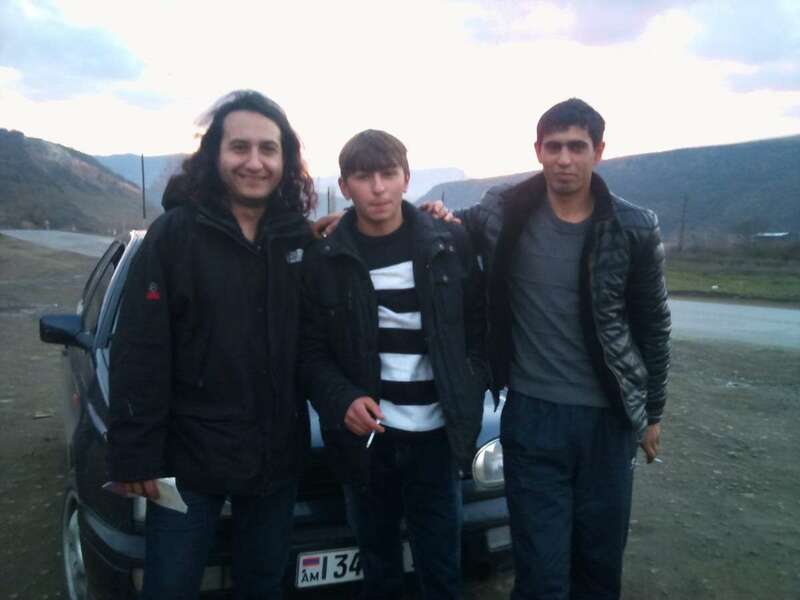 Three guys in a small car take us to Ayrum. Somewhere on the way they stop the car at a petrol station and they all get out of the car. Two teenagers get in and drive off with us in the back, without any explanation at all. We’re a bit concerned by this turn of events, but the guys drop us on the road after ten minutes and ask to take pictures with us. They seem very pleased to have met us, and wave us off happily. A guy in a Lada wants money to take us to the border. Hrach says “lamouzhna,” a Russian-derived word we haven’t a clue about the meaning of, but one which appears to work very well in such situations. He agrees to take us for free since he’s going there anyway. He drops us outside the small row of shops that lead to the border and we walk across. “Hello!” The Armenian border guard greets us merrily in English as we saunter towards his window. He peers at our passports, eventually stamping them both. “Goodbye my friend!” he tells Hrach in English, handing his passport back to him and grinning from ear to ear. I feel very certain there is a bottle of vodka hidden under his chair. The Georgian side stamp our passports and we get a short ride to the first village, Sadakhlo, with an Armenian guy. We walk into the darkness and try hitching on the side of a street, but there seems little to no chance of anything stopping. We walk back to the small carpark where we were first dropped off and see a truck trundling towards us. I stick my thumb into the air and he grinds to a halt, kicking the dust into the air. Like most Georgian men I have met, this guy is called Giorgi. After establishing that we have zero languages in common, Giorgi drives us in silence, the truck rocking us over the potholed roads and into the city of Tbilisi.